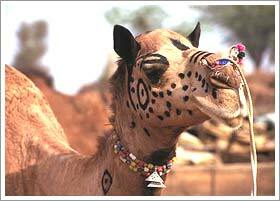 Rajasthan Tour - Experience the new dimension of India Tourism. Nagaur Festival is one of the most important festivals celebrated with immense enthusiasm in Rajasthan. It is held in Nagaur, Rajasthan, during the month of January-February. This festival is dedicated to cattle and is also known as Nagaur Cattle Fair. It is the second largest cattle fair of the world after the Pushkar Fair. It is a celebration which continues for eight days. Camels, horses and cattle participate in the fair with their owners sporting colorful turbans. Here you will notice that almost all the animals participating in the fair are well bred. Traders come to this fair either for buying or selling the cattle. Here they have so many options to choose from. Nagauri breed of cattle is famous. Apart from the commercial activity, the Nagaur Fair hosts several cultural activities. Watch the camel races packed with fun. Participate in competitions like tug of war and other games or simply enjoy the role of a spectator. Dig on the delicious Rajasthani food available on the various stalls in the fair. Rajasthani handicrafts stalls add more color to the fair. As the day draws to a close, the ambiance at the venue of Nagaur Fair takes a whole new meaning. The artists from the renowned entertainment communities of Rajasthan take the center stage leaving the audience mesmerized. And the dull desert vibrates with traditional performances.